The Adamantium Helm of Tohan is a legendary Adamantium artifact. The helmet is medium weight, while still being very durable and offering superior protection. It has an immensely high potential for enchantment. Nothing is known of Tohan or the helm's origins. The helm came to rest in the ruins of Onnissiralis, a shrine to Sheogorath located on a small island in the Sheogorad region of Vvardenfell, far west of Dagon Fel. It was kept in a tightly locked chest, openable only by key. In the late Third Era, a Dunmer man by the name of Norvayne attempted to cleanse the ruins, but was slain by the Daedra worshippers. Years later, in 3E 427, his sons, Daris and Dalin Norvayne, set out to avenge their father and cleanse the ruins. Following rumors of the Helm of Tohan, the Nerevarine arrived at Onnissiralis. The brothers disagreed on whether to accept the Nerevarine's aid or not. It is unknown how the events unfolded, but the ruins were cleansed of worshippers. The brothers handed the Nerevarine the key to the chest which contained the helm, and it was taken from the ruins. 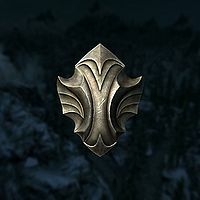 The Amulet of Infectious Charm is a legendary magical trinket once owned by the Nord chieftain Hrothmund the Red of Solstheim, the first chieftain of Thirsk. The amulet is enchanted to boost the personality of the wearer hugely, but at the cost of being constantly fatigued and susceptible to disease. According to legends, Hrothmund was ugly as a troll, but received much womanly attention due to the amulet. The amulet was buried in Hrothmund's Barrow high in the Moesring Mountains after he was killed and eaten by Ondjage, the Fell Wolf. In 3E 427, a nervous Breton mage from Ald'ruhn called Louis Beauchamp began to search for the amulet, hoping that it would aid him in his failing love life. He constructed a patchwork airship using Dwemer technology and hired a crew to fly from Ald'ruhn to Solstheim to recover the amulet from the barrow. The crew would be able to find the barrow from the sky by searching for Hrothmund's Bane, a stone geoglyph in the shape of Ondjage's head, with the entrance to the barrow located in the wolf's eye. However, the airship was poorly constructed, and began to fall apart the minute it took flight. The ship came within sight of Hrothmund's Bane before a severe blizzard struck, ripping the vessel apart. It crashed south of the barrow, in the Moesring Pass, killing the entire crew apart from Captain Roberto Jodoin. The captain soon succumbed to either the cold or the snow wolves. Having received no word from the crew, Beauchamp sent the Nerevarine to Solstheim to look for them. 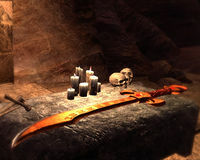 The Nerevarine discovered the crash site and successfully recovered the amulet from the barrow. Beauchamp went on to use the amulet to great effect on the women of Ald'ruhn, although at the cost of his health. The Amulet of Kings, also called the Amulet of the Kings of Glory, was a pendant traditionally worn by the ruling emperor of Cyrodiil. 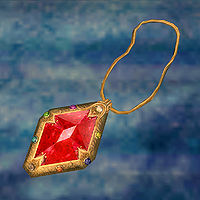 In the center of the amulet was the Chim-el Adabal, also known as the Red Diamond, a huge soul gem of Ayleid origin. It was held in a golden clasp surrounded by eight smaller gems that represented the Eight Divines of the original Cyrodilic pantheon, created by Queen Alessia. It served as the symbol of the divine right of the Cyrodilic emperors. The amulet was an important component of the coronation ceremony and a powerful artifact when used for divination. The soul of each reigning emperor was enshrined within the central stone, presumably during the coronation ritual involving the Dragonfires and the divine Covenant. In this way Cyrodiil's rulers were brought together in death, forming an 'oversoul' that could provide counsel to their successors. The amulet could only be worn by certain individuals—those who could be said to have the 'Dragon Blood' in their veins. The specific requirements, however, have been a subject of debate, and they may simply have called for the attributes of a ruler or some divine mandate. The Ansei Wards were three ancient Redguard relics that contained the spirits of powerful Ansei warriors. They were created in the First Era to combat against the threat of necromancy in the Alik'r Desert. According to some scholars, these treasured relics have played an important role throughout the history of the Alik'r. The Wards themselves take the form of large ornate golden scimitars encrusted with gemstones. The Anvil of Mithas is an ancient anvil created by Mithas, the greatest Dwemer smith. It is twinned with the Hammer of Gharen, which is the only object strong enough not to shatter when used to shape metal upon the Anvil. When the Hammer strikes the Anvil, it produces a ringing which reveals the location of the entrance to the Dwarven mines beneath Red Mountain. By the time of the Imperial Simulacrum, the Anvil had come into the possession of King Casik of Ebonheart. The King had the Eternal Champion bring him the Hammer, which had been lost in the dungeon known as Black Gate, and used the artifacts to craft the finest armor and weapons in the realm. The Anvil has never reportedly left the city's palace since. Sometime in 2E 583, the Morag Tong assassin Naryu Virian uncovered a plot uncovered a plot within the Morag Tong to coordinate a coup to take over the Tong. It involved obtaining various goals, some involving objects, and one of them was to obtain the Abacus. The people who were involved in this plan were called the Seven Secretives, and she tracked one of them down to Bahraha’s Gloom. Naryu put on an ancient Zeht Priestess regalia as a disguise and came across a coffin. When she touched it, she awakened the tomb's guardian, a Mournful Aegis. The Secretes planned to set a trap, allowing her to get killed by the Aegis, but it backfired, as the regalia allowed Naryu to go unharmed, and the Aegis rended the plotter, killing her. Within the coffin she found the Aurbical Abacus and smashed it to pieces. Auriel's Quiver is a mysterious ivory case, embossed with gold. 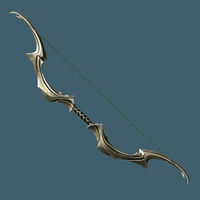 It may be associated with the elven god Auriel and his legendary bow and shield. At some point, the quiver was given "scholarly markings" to identify it. It was being circulated throughout Tamriel circa 2E 582. Nothing else is known about the quiver. Auriel's Shield is an artifact used by the Elven god Auriel, an aspect of the Imperial Akatosh, the Dragon God of Time. 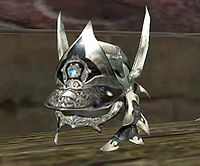 It takes the form of a small shield, sometimes rounded, made from either ebony or moonstone. 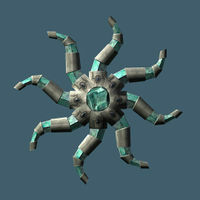 It has several magical abilities that help to make its wielder nigh invulnerable. Its known enchantments include resistance to fire, shielding from either magical or physical attacks, healing properties, magical armor enhancement, and spell reflection. Sometimes it also appears to be seemingly unenchanted. The shield has the ability to absorb the power of blocked attacks; this energy can then be released by bashing an opponent with the shield, delivering a devastating physical blow. Its shielding ability is supposedly unsurpassed. The shield is twinned with Auriel's Bow. Like many great artifacts, the shield has a life and personality of its own, and does not feel bound to its user. A popular fable tells of it abandoning its owner in her greatest hour of need, but this story is thought to be apocryphal. Legend says it was created by Anuiel at Auriel's request so that the latter could use it in his campaign against the forces of Lorkhan during the Dawn Era.